This month we would like to congratulate I-80 Livestock 4-H Club for being awarded the Nebraska 4-H Club of the Month for September 2018. This club from Aurora, Nebraska, in Hamilton County, has truly made a difference in its community. The club is dedicated to building strong citizenship and teamwork through various activities. 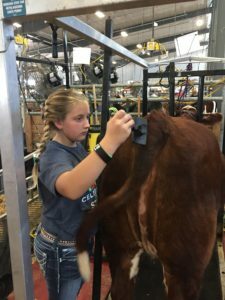 This club formed several years ago, when independent 4-H’ers were looking for a club experience. Over the last three years, this club has grown from three families to six! All summer the seven-member club competed in competitions, attended training sessions on fitting and fed and maintained their cattle. Two of the club members are junior leaders and two are shooting sports ambassadors for the state of Nebraska. Four of the six are also FFA members. Three of the members have shown at state fair for the last 4 years! They do all this while maintaining stellar GPA’s in school. No Comments to "September 2018 Club of the Month"